that we give a great value full-day out. The people who come to our railway are not "passengers" they are visitors. Everything we do must be of the best quality and value. Developing our relationship with groups, tour operators, schools etc. These follow on from all the above with volunteers taking responsibility for specific aspects of the work. Much of the work is done from home so access to the internet for e-mails etc. is essential. To work well in this department, it is ideal for each member to also work in another part of the railway - preferably an area that is visitor facing. The work isn't "fixed" as to time commitment other than specific annual tasks - jobs and opportunities come up on an irregular basis and must be dealt with as they arise. There is no formal structure to the department although each member does take on specific roles. Members meet once every 6 weeks for a couple of hours to review progress and instigate new work. 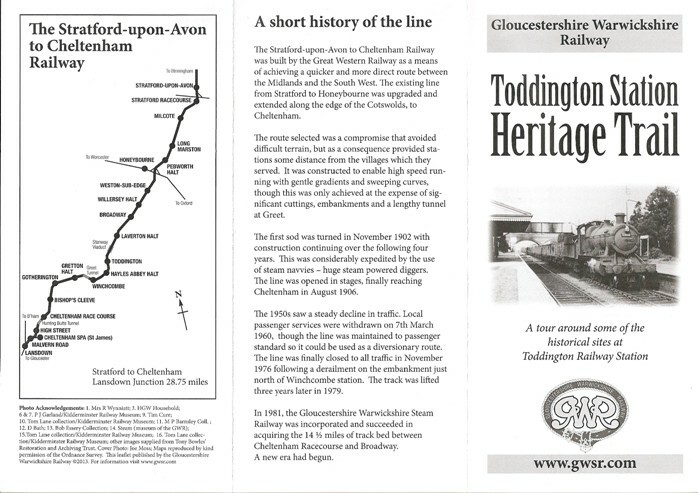 Almost all other correspondence is dealt with by e mail with just the occasional phone call or meeting at Toddington. No prior training is required - all we look for are volunteers to want to give visitors a great day out. This department are looking for volunteers to help with leaflet distribution but as this activity is looked on as an adjunct to other volunteering why not join Retail or our Special Events Teams? Please see here to learn how to become a volunteer.